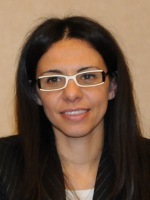 Valeria Miceli, Ph.D., is Professor of Economics of Financial Markets at Università Cattolica del Sacro Cuore, Milan. She graduated at Università Bocconi and she got her Ph.D. from Università Cattolica del Sacro Cuore. In the years 2010 and 2011 she was research fellow as post-doc at the Judge Business School, University of Cambridge (UK). Before joining the academic profession, she was senior consultant in leading consultancy firms (Ernst & Young, Capgemini) in the field of corporate finance.